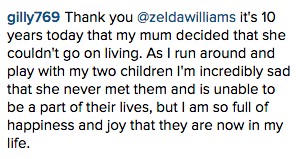 Zelda Williams, daughter of late actor and comedian Robin Williams, took to Instagram Sunday to talk about grief and how she has dealt with sadness and pain. Moonrise on the lake 🌕 I spent this night shivering and laughing under a clear, cold sky full of stars with people I love just to witness something beautiful. We mooned the moon and laughed ourselves hoarse, and I'm so incredibly grateful for every silly second. I came to a realization this year that I feel compelled to share here, for whomsoever may need it: Avoiding fear, sadness or anger is not the same thing as being happy. I live my sadness every day, but I don't resent it anymore. Instead, I do it now so that the wonderful moments of joy I do find are not in order to forget, but to inhabit and enjoy for their own sake. It's not easy. In fact, I'd say it takes much more effort to consciously do than it does to just stay sad, but with all my heart, I cannot tell you how worth it it is. And for those suffering from depression, I know how dark and endless that tunnel can feel, but if happiness seems impossible to find, please hold on to the possibility of hope, faint though it may be. Because I promise you, there're enough nights under the same yellow moon for all of us to share, no matter how or when you find your way there. The Instagram post comes about a year after the death of her father, who lost his battle with depression on August 11, 2014. In the caption, Williams talks about coming to a realization this past year, one that she felt “compelled to share” with her followers. She went on to talk about her own experience grappling with sadness and grief. Williams explained that her willingness to feel pain has allowed her to fully experience happiness in her life, as well. “The wonderful moments of joy I do find are not in order to forget, but to inhabit and enjoy for their own sake,” Williams wrote. The 26-year-old then reached out to anyone battling mental illness, offering support and sympathy. 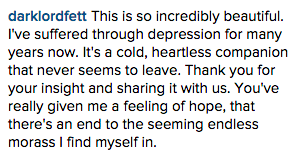 An outpouring of gratitude for Williams’s words came in the days following her post. 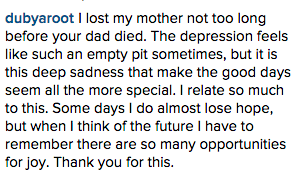 Many of those who commented shared personal stories of grief, loss, or battles with mental illness.